BUENOS AIRES -- With Argentina looking like a juggernaut in World Cup soccer and patriotic holidays in full swing, the national flag has been flying everywhere you look on this city's colonial boulevards. Whether fluttering as a pennant on a car antenna or draped over a wrought-iron apartment balcony, it is an eye-catching standard: one white horizontal stripe -- with a golden sun at the center -- sandwiched between two sky blue horizontal stripes. Or are those two lavender stripes? Or are they azure or cerulean blue? It may sound like a picayune point, but the dispute over the tone of blue in the Argentine banner has triggered a kick fight in the usually genteel world of vexillology, as the study of flags is known. The flag flap has inspired presidential decrees, legislative maneuvering, plotting in historical societies and reams of obsessively detailed research papers. Friendships have been broken and bitter broadsides fired in the press. And there's no end in sight to a debate that may be the last battle of Argentina's 19th Century civil war. 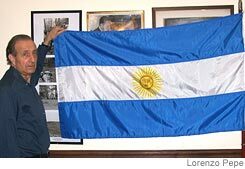 Flag activist Lorenzo Pepe had a darker-toned Argentine flag custom-made. Dark blue is identified with the losing side, the Federalists, and their leader, the infamous strongman Gen. Juan Manuel de Rosas, who sought greater autonomy for provinces and close ties to the Roman Catholic Church. Lighter blue is identified with the liberal opponents of Gen. Rosas, especially the Unitarios, who wanted a more centralized government. "In the U.S., both the Confederates and the Northerners are given their place in history, but sadly that's not the case here," says Lorenzo Pepe, an ex-congressman with the dominant Peronist party who has led the push to darken the flag in honor of Gen. Rosas. While Mr. Pepe spoke in his office, horns were tooting outside as Argentina's World Cup team was thrashing Serbia-Montenegro 6-0 in Germany. But Mr. Pepe was too worked up about Gen. Rosas's defeat and its effect on the flag to pay much notice. Mr. Pepe complains that Argentine soccer fans -- who have more reason to cheer after their team beat Mexico 2-1 on Saturday to move into the quarterfinals -- brandish flags with a blue so bleached out that "they turn out looking like white cloths." His office is decorated with a darker-toned national banner specially commissioned from a flag-maker. The Cup is an especially irksome time for advocates of a darker banner because the light blue flag motif is used in the most frequently worn Argentine soccer jersey. Federalists' only solace is that an alternate jersey the team uses is dark blue. Advocates of light blue chastise the modern day partisans of Gen. Rosas and the Federalists for playing games with the national standard. "If they want to defend the federalists, let them write books, but leave the flag alone," says flag scholar Salvador Navas. Unfortunately, he says, Argentina's 1944 law on national symbols leaves room for ambiguity by describing the flag's coloring as celeste, or sky blue. "Is it the sky on a sunny day or during a rainstorm?" Mr. Navas asks. "Is it the sky in summer or winter?" 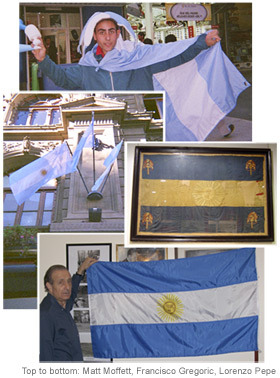 Counterclockwise from top: An Argentine soccer fan in full light blue regalia, the current flag flies from a building, Lorenzo Pepe with his custom-made darker blue flag and the original flag used in 1833 by Federalist leader Juan Manuel de Rosas. He says it would be possible to precisely specify the shades on the flag among the 1,114 tones in the widely used color-matching system devised by Pantone Inc. of Carlstadt, N.J. But that would require achieving a consensus in the fractious Argentine Congress, which seems all but impossible. Flag-shop owner Carlos Caprav tries diplomatically to satisfy both parties to the dispute over Argentina's colors, saying his banners are "bluish sky blue." Karina Cortez, whose shop sells patriotically toned rooting paraphernalia ranging from flags, to horns, to fool's caps, tries to turn vagueness about the colors into a selling point. "We offer almost any product in any shade of blue you would want," she says. The flag debate is part of a recent revival in Argentines' interest in history, as the country has enjoyed a surprising resurgence from a horrific economic bust. Argentines have eagerly sought out newly produced books and films about historical matters, such as the 1976-83 dictatorship that "disappeared" thousands of suspected leftists and the disastrous 1982 Falkland Islands War with England. "The recent changes have been so dramatic that people are questioning who we are and how we got here," says Alberto R. Perazzo, a psychologist whose book on Argentine flags is headed for its third printing. This being Argentina, though, there's little agreement on the answers to this national identity crisis. Says Francisco Gregoric, a Buenos Aires vexillologist. "The only thing we can agree on is that we want Argentina to win the World Cup." Every Argentine school child learns that the sky blue and white national flag was first unfurled in 1812 by Manuel Belgrano, whose death date, June 20, is celebrated as Argentina's flag day. The Unitario faction, ascendant for a time in the 1820s, adopted Mr. Belgrano's banner. Because of the reach of the Argentine navy, his flag influenced those of Guatemala, Honduras, El Salvador, Costa Rica and Nicaragua, along with that of neighboring Uruguay, notes Whitney Smith, founder of the Flag Research Center in Winchester, Mass. Federalists, under the dark blue banner, took power in the 1830s, led by a rough and tumble Gen Rosas. The military man was known as "the restorer of the laws" for his iron-fisted ways. Gen. Rosas once had himself put in stocks after absentmindedly violating his own rule about carrying a dagger on Sundays. In 1852, Gen. Rosas lost a battle to a force composed of Unitario remnants, disaffected Federalists and troops from Brazil and Uruguay, and was exiled to England. "Everyone knows winners write the history, but it turns out they also design the flag," says Enrique Bonomi, a historian at an institute dedicated to Gen. Rosas. After Gen. Rosas's ouster, Argentina reverted to the lighter flag, though with plenty of variations in tone. Gen. Rosas enjoyed something of a rehabilitation beginning in the late 1980s. Peronist president Carlos Menem had Mr. Rosas's remains returned to Buenos Aires from England and put his image on the 20 peso bill. Near the end of his term, Mr. Menem also issued new specifications on flag design that would have directed all of the flag-making business to one company. The opposition government that succeeded Mr. Menem struck down the new rules to avoid giving one company a monopoly on flag sales -- and exclusive control of the banner's color. Then in 2001, the forces of darkness struck back. Mr. Pepe engineered approval in the lower house of Congress of a bill to darken the blue in the flag after what he says was 17 years of politicking. But light blue partisans say Mr. Pepe pulled a fast one, including the bill among hundreds of hastily approved measures as the legislative session was winding down amid an economic emergency. Mr. Pepe's bill never became law. It stalled in the Senate, partly because of a position paper by the National Academy of History that was favorable to adherents of lighter blue. Amid the continuing legislative stalemate, Mr. Pepe continues to give talks and distribute booklets about darkening the blue.